No salsa is complete without the Verde Tomatillo! This tomatillo is bursting with flavor, with over 50% more sugar than other tomatillos. Verde is also earlier, bigger and tastier than any other. sauces and salsa, tomatillos can be used in appetizers, desserts and jams as well. Tomatillos also are known as a husk tomato, due to the papery husk covering the fruit. Before Planting: Two or more tomatillo plants are required for the plants to blossom. Wait until all danger of frost has passed before planting the tomatillos outside. 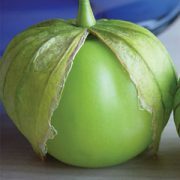 Since tomatillos have a long growing season, they can be started indoors up to eight weeks before the last frost date. 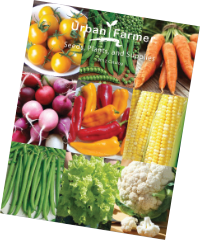 Planting: Sow 2-3 seeds per cell, 1/4″ deep, indoors 4-5 weeks before last frost in your area. Transplant after danger of frost and grow without support. Plants grow big, and if unpruned, should be spaced 2-3′ apart. Tomatillos ripen fruit early, and are adapted North and South. Watering: Similar to tomatoes, tomatillos require frequent watering. again when the first flowers begin to appear, this time using a 5-10-10 fertilizer. 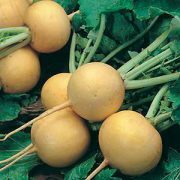 Fertilizers high in potassium and phosphorous can lead to high fruit yields. Over fertilizing can lead to leafy plants with little fruit, so be sure to follow the directions on the fertilizer when it comes to application. Days to Maturity: Tomatillos are ready to harvest when the green fruit fills out the papery husk. Similar to tomatoes, they can be harvested early and then left in a sunny window to further ripen. also wash the sticky substance from the tomatillo’s flesh. Tips: Studying the leaves of the tomatillo plant can show if it has any deficiencies. Leaves with a purple tint have a phosphorous deficiency and yellowing leaves means there could be a magnesium deficiency. Approximately 12,500 seeds per ounce.